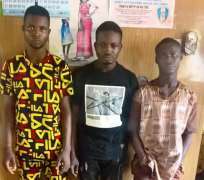 The suspects; Ramoni Yusuf, 24, Abiodun Sikiru, 23, and Moses Oluwasegun 23 were arrested following a complaint lodged at Adatan Divisional Police Headquarters. The victim reported that she followed her boy friend one Abass Ramoni who is now at large to attend Glorious Guy Carnival on the 3rd of January 2019 at Elega junction Abeokuta. She stated further that shortly after the carnival, at about 2.00am of 4th January 2019, she followed her boyfriend to his residence at Osoba Street, Elega Abeokuta to pass the night, unknown to her that the boyfriend had arranged four of his friends in his house who suddenly stormed the room and raped her one after the other. The Police Public Relations Officer in the state, Abimbola Oyeyemi said "Upon the report, the DPO of Adatan Division CSP Oluwadare Joshua led his detectives to the area. The PPRO said three out of the five hoodlums were apprehended. The victim was quickly taken to the General Hospital for medical treatment and that report confirmed that the victim was raped. The Commissioner of Police, CP Ahmed Iliyasu condemned the action of the men and ordered a massive manhunt for the remaining two suspects. He directed that the case be transferred to Anti Human Trafficking and Child Labor Unit of the State Criminal Investigation and Intelligence Department for proper investigation and prosecution of the suspects.